Sieve the flours and beet powder together into a large bowl. In a separate bowl, whisk together the eggs, yolks and beet puree until smooth. Make a well in the centre of the flour an pour in the egg mix. Slowly incorporate the flour into the egg, forming a loose dough. Invert the dough on the bench, divide it into two and knead into smooth balls. You will need to add some more flour as you knead it – but not too much. Wrap in cling film and rest for a minimum of 1 hour. Take 4x Large whole red beetroots and wrap in foil. Roast in 200℃ oven for 2 hours. Remove the foil and bake for another 1 hour until dry. Cool, peel, then puree for 4 minutes until super smooth. DO NOT add any liquid. In a stainless steel pot, add the onions and butter, then cover with water. Cook until the onions are super soft. Then turn up the heat and caramelise. Drain off excess liquid then cool. Fold the onions through the goat's cheese mix and add the rest of the ingredients. Taste and adjust seasoning if necessary. Transfer to a piping bag. Mix all together, taste and adjust seasoning. Clean up bunches of yellow and red beetroots. Cut in half and drizzle with olive oil, salt and pepper. Roast in the oven until cooked. Cool. In a stainless steel pot, add the onions, butter and oil. Cover entirely with water. Cook the onions on a low heat until super super soft – ABSOLUTELY NO CRUNCH – about 3 hours. When the onions are soft, turn up the heat. Constantly stir until the onions cook to a deep brown. Fold in the flour and cook out for 2 minutes then add the cream and thyme leaves. Bring to a simmer and cook on a simmer for 5 minutes. Take off the heat then pour the mix into a high-speed blender and blend until super smooth. Season with salt and white pepper. Get your hands on a pasta machine and get yourself some ravioli moulds – you can get these at any good homeware stores. Take the dough and roll the dough through the widest setting – sprinkling a small amount of flour on it to prevent sticking. Fold the dough in half and continue rolling through the widest setting until the dough turns from rough to smooth. When you have reached this stage, you can now roll the dough through the lower settings until the thickness is 1mm. Lightly flour the ravioli moulds and lay the dough gently on the moulds, using an egg to press the dough down into the moulds. Fill each ravioli mould with the filling, coming just to the top. Brush the next sheet of pasta with egg wash and press it down over the moulds – expelling any air bubbles. Bring a pot of water to the boil. Blanch 7 ravioli pieces (per serve) for 2 minutes then carefully take out and drain. MRS I love cooking with eggplants in the late summer and early autumn while it’s still warm – we grow them in the garden and they provide a nice base or this chunky sauce. The bacon here is optional but it gives everything a lovely salty, smokiness that takes it to the next level. Heat the olive oil in a large saucepan over a medium heat, add the onion and cook for 1–2 minutes, until slightly softened. Add the eggplant and oregano, toss to coat in the olive oil and cook for 2–3 minutes, adding a splash more oil if the eggplant absorbs it all and the pan is looking dry. Add the bacon and toss to combine, then cook for another 3–4 minutes, until the eggplant is tender. Stir in the tomatoes, vinegar, tomato paste and salt and bring to the boil, then reduce the heat to a simmer and leave to cook for 10–15 minutes, until the sauce has thickened and reduced. Meanwhile, bring a separate large saucepan of water to the boil, add the fusilli and cook according to the packet instructions. Reserving a small cup of the pasta cooking water, drain the fusilli, then add it to the pan with the eggplant sugo. Toss everything together, adding a splash of the pasta cooking water, then divide among bowls. Scatter over the feta and parsley and serve. Recipe extract from Mr & Mrs Wilkinson's How it is at Home (Hardie Grant) You can follow Sharlee on Instagram @sharleegibb and her hastag #howitisathome for her adventures cooking for kids in a busy household. This seems simple but pretty hard to get right. It’s all about timing your vongole with your lemon juice and butter to get the best-emulsified sauce to coat your pasta. In a cold pan put the oil and vongole in the pan. Place the chilli, garlic and pepper on top of the vongole making sure it doesn’t touch the bottom of the pan. The reason for this is depending on the juiciness of your vongole the garlic and chill can burn quite easily if your shells don’t release lots of delicious liquid. Place a lid on top on cook on high heat. Lift the lid occasionally to check if all the shells have opened. Once they have all opened stir the chilli and garlic around the pan to ensure you are roasting it all off nicely. They will start to release their liquid. When most of the juice from the vongole has reduced add your lemon juice and butter stirring until you see the sauce emulsify and then add your hot pasta and parsley. Now taste to see if you need salt and how much. Depending on the amount of salty water that comes out of the shells you may only need a touch. Cook the pasta a little further in this sauce to ensure it’s soaking up all the juices and enjoy one of the best southern Italian pasta dishes ever. Your ingredients have to be really great here for this simple pasta. A pasta like this is very light on the sauce but that is its beauty. The tomato here is not much – enough to just macchiare. Pici - thick, hand-rolled flour and water pasta is good here, or thick spaghetti. Make the breadcrumbs by hand & quite big – can't use the fine pulsed bought variety here. To make the crumbs, drizzle 1 tablespoon of olive oil here and there over the bottom of a large frying pan that will eventually hold all your pasta. Add 1 garlic clove and the breadcrumbs and gently sauté until golden. Turn through with a wooden spoon so they all get evenly golden. Add the rosemary. When the rosemary smells good, remove the pan from the heat and scrape the crumbs into a bowl. Wipe out the frying pan with paper towel and put it back on the heat. Put a pot of salted water on to boil for the pasta. In the frying pan, heat the remaining 4 tablespoons of olive oil with the remaining garlic clove and add the pancetta. Sauté until nicely golden, then add the tomatoes. Break them up with a wooden spoon and simmer for 5 minutes or so, to dissolve them in the oil. Season with salt and ground chilli. Cook the pasta to al dente, drain and add to the frying pan holding the sauce. Add some of the pasta cooking water to help the sauce along. Turn through to distribute everything evenly, then divide among four warmed wide pasta bowls. Serve a little per bowl at first, as much of the good sauce goes to the bottom. Pile the breadcrumbs over the pasta, heap some shaved pecorino over each and give a good grind of black pepper. Serve at once. This is the richest ragu you’ll ever make and probably the most sophisticated in flavour. Half the work is already done because the base is pork and fennel sausages, preferably purchased from a good Italian butcher. They’re already cured and seasoned so you’re getting instant flavour into the braise. Serve this beautiful ragu with any pasta: gnocchi or pappardelle are my favourites. This recipe can also be the start of a spectacular lasagne, as I discovered one desperate Sunday: add two extra tins of tomatoes and layer the ragu with pasta sheets and béchamel. Delicious! Remove the skins from the sausages and crumble the meat. Discard the skins. Heat a heavy-based pot on medium heat, then add the sausage meat and pancetta. Fry until the sausage meat is golden brown, stirring every few minutes. Don’t worry if you get some sticky, crunchy bits – it’s all flavour. Add the onion, garlic, carrot, celery, bay leaves, dried chilli and fennel seeds. Stir in well. The vegetables will sweat a little and ease all the crusty, caramelised pieces from the bottom of the pot. Continue to cook gently for 15 minutes, stirring every few minutes, until the vegetables are soft and slightly caramelised. Add the tomato paste and red wine and bring to a simmer. Add the stock, tinned tomatoes, rosemary and oregano and continue to simmer for about 45 minutes on low heat, until you have a thick, intense sauce consistency. When cooked, season the ragu carefully (the sausages will already be salted), then add the olive oil and the cooked pasta. Bring the pot to the table. This recipe solves a bunch of problems! One, dinner in 30 minutes. If ever I tell the family that it’s spaghetti bolognese tonight, they are so happy. I get no grumbles, only love, and that’s so nice and relaxing. Two, crumbly mince. One of the main gripes I hear about Thermomix is about the way it cooks mince. I hate clumpy, sandy, dry mince too – you’ll never get that with this recipe. Three, leftovers! This recipe makes about 2 litres of sauce so you’ll probably have some to keep in the freezer for emergency dinners and even lasagne. Four, freedom! Let’s get one thing straight: this isn’t a traditional Italian recipe. 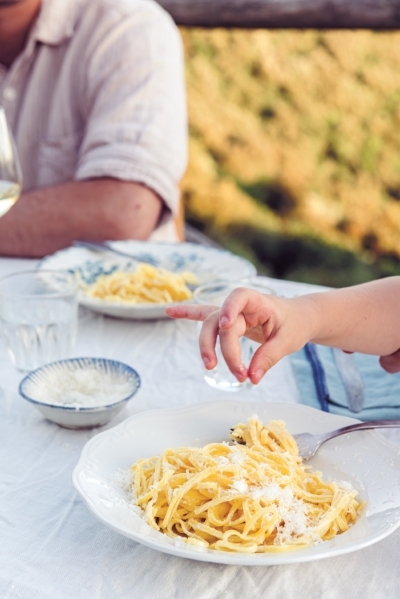 In fact, there’s no such thing as spaghetti bolognese in Italy. In Bologna, they call it tagliatelle al ragu, that is flat ribbon pasta with meat sauce. You’ll get blank looks if you ask for spag bol! Five, wine supply. Most bolognese recipes call for red wine. I know that lots of people don’t have it on hand and, if they do, may not wish to open a bottle for a splash of cooking wine. To be honest, this isn’t me! But this recipe is for ‘wine – meh’ cooks too. And wine lovers, see the variation and pour yourself a glass while it cooks. Six! Yes, there’s more! This nourishing spag bol is packed with veg and light on meat. It’s a great way to get extra nutrients on the dining table. Place onion, garlic, carrot, celery, zucchini and mushrooms in mixing bowl of a Thermomix. Chop 5 sec/speed 5, or until well diced. If necessary, scrape down and mix for a further 2 sec/speed 5. Add olive oil, salt and bay leaf. Cook for 6 min/Varoma/speed 1. Add mince and break up well with a spatula. Cook for 4 min/100°C (212°F)/Rev/speed 1. Add vinegar and milk. Stir with the spatula, ensuring mince is not stuck to the blades. Cook for 3 min/100°C(212°F)/Rev/speed 1. Add passata and tomato paste and stir with the spatula, ensuring mince is broken up. Cook for 20 min/90°C (195°F)/Rev/speed 1. Every 5 minutes, turn up speed and stir for 10 sec/Rev/speed 3 (see Tips). Taste for seasoning. Don’t skip the stirring stages at step 5, but it doesn’t have to be exactly every 5 minutes. You can set 4 x 5 minute cooking times if you prefer. If you do decide to use wine, my rule is, it has to be good enough to drink if I’m going to use it in cooking! I love the bitterness of the chicory paired with the sweetness of the raisins, and the crunchy, salty, garlicky crumbs that adorn this dish. Another simple, but rewarding, partner for your orecchiette. Heat the butter and oil in a large frying pan over a low heat. Gently cook the onions with a pinch of salt for 10–15 minutes or until soft and sweet. Meanwhile, prepare the garlic crumbs. Gently warm the olive oil in a frying pan over a low heat with the garlic. After a few minutes, remove the garlic and increase the heat to medium. Add the breadcrumbs, stirring to coat. Fry for 2–3 minutes until crisp and golden. Season with salt and set aside to cool. Bring a large saucepan of generously salted water to the boil and cook the orecchiette for about 5-6 minutes or until al dente. Add the chicory, parsley and raisins to the onions and stir to coat, cooking for just a minute or two, until the chicory has begun to collapse. Transfer to a large bowl and squeeze over the lemon juice. Drain the orecchiette and mix with the chicory. Season to taste and serve immediately, drizzled with a little extra olive oil and topped with the garlic crumbs. Orecchiette is perhaps my most loved of all the pasta shapes. A big call, I know, but I think it’s true. Fresh orecchiette, made by hand, is a wonderful thing. It not only is a pleasure to eat, but my favourite to make. The repetitive action of cutting, rolling and flicking gives me time to think clearly. It slows me right down, puts me in that moment – cutting, rolling, flicking. It requires few ingredients and is very capable of feeding hungry guests. Hailing from Puglia, in Italy’s south, orecchiette translates to ‘little ears’, and they are the ultimate sauce-catchers. Tip the flours and salt onto a clean work surface and combine. Create a well in the centre and slowly pour in enough of the water, mixing with your hands, to make a soft but not sticky dough. Knead well for 10 minutes until smooth and elastic, adding a little more flour if the dough is too sticky. Cover with a damp cloth or plastic wrap and allow to rest at room temperature for at least 30 minutes. Divide the pasta dough into four pieces. Cover three of the pieces and set aside. On a lightly floured work surface, roll the dough into a long sausage shape about 1 cm in diameter, then cut into 1.5 cm lengths. Take one length and, using a flat, non-serrated butter knife, place the knife on top of the piece of dough and drag it towards you, with the knife at a 30-degree angle – the dough should curl up a bit as you drag it and slightly stick to the knife. Using your index finger and thumb, gently invert the orecchiette and pull it away from the knife. This is best done on a wooden surface – so that the dough grips a little – so if you don’t have a wooden bench, use a large wooden cutting board. The orecchiette should have a rough exterior and plump edges. Place the shaped orecchiette onto a board or tea towel that is generously dusted with semolina flour. Continue the process with the rest of the pasta dough, arranging the orecchiette in a single layer. Bring a large saucepan of generously salted water to the boil and cook the orecchiette for about 5–6 minutes, until al dente. Photography by Lauren Bamford. Styling by Deb Kaloper. Any pasta shape can work with this. With the silky, creamy, tangy sauce of lemon and zest, I particularly like something long and flat, like linguine, bavette or tagliolini. A dash of cream binds everything together, but my husband Marco sometimes likes to add caprino (soft and tangy goat’s curd) instead. The sauce can be made in the time it takes the pasta to cook. 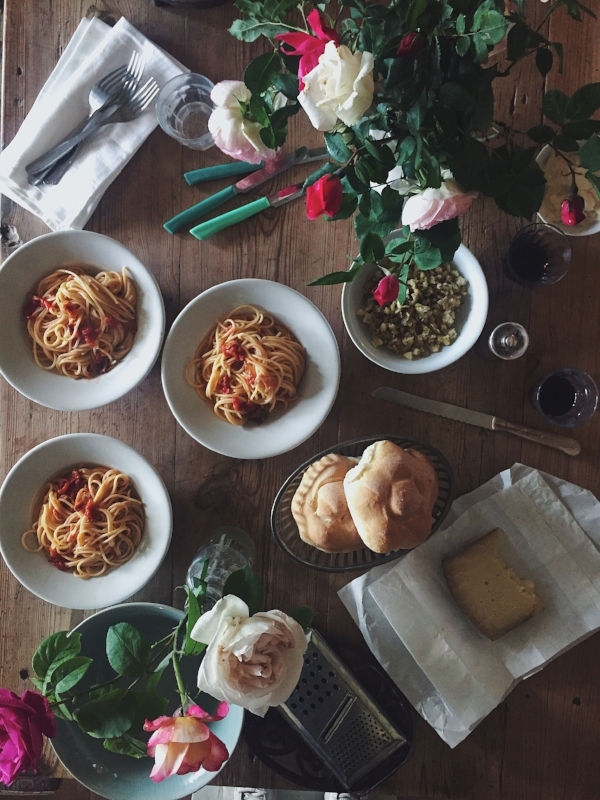 If you’re in a real hurry to get food on the table, use fresh pasta (as opposed to dried) and it only takes minutes to cook – and you’ll still be able to make the sauce in time. Note: Seek out organic lemons, as they haven’t been waxed or treated with pesticides, and since the flavour of this dish relies mostly on their zest, those kinds of treatments are the last thing you want to taste. Do give them a good rinse under running water and pat dry before using, though. Put the pasta in a large pot of boiling, well-salted water – ideally, use 1 teaspoon of salt per 1 litre of water. Mr Wilkinson is not too keen on pesto (it’s the pine nuts he doesn’t like) but this is one of my go-to dinner dishes for when there’s not much time to cook. This garlic-free version is good for both vampires and the boys, who – despite saying they don’t like green stuﬀ on their plates – for some reason devour pesto pasta. To make the pesto, blitz all the ingredients together in a food processor to a rough paste. Taste and add more salt or lemon juice if desired. Cook the pasta in a saucepan of boiling water according to the packet instructions until al dente, adding the broccoli florets and green beans, if using, to the pasta water for the last few minutes. Drain and return to the pan, then toss through half the pesto. Divide among bowls and sprinkle over some grated parmesan to finish. TIP Spoon the excess pesto into an airtight container, cover the surface with extra oil and keep in the refrigerator for up to 1 week until needed. At the end of summer I like to scale this recipe up and make it with the last basil of the season, dividing it into portions, freezing it (it’ll keep for 6 months) and defrosting as needed.